Verbier is a picturesque Swiss ski resort nestled on a vast plateau almost 5,000 ft (1,524m) above the valley floor and surrounded by majestic snow-covered mountains. 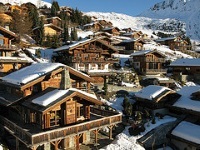 Verbier lies at the heart of Les Quatres Vallées (Four Valleys) and is the holiday hub of this extensive ski area. A sophisticated network of cable cars and gondolas connect all the holiday resorts in the region and provide access to 102 miles (164km) of marked pistes. Verbier is the primary ski resort of French-speaking Switzerland, attracting advanced skiers and snowboarders to its demanding slopes and unlimited off-piste opportunities. Although quaint in appearance, a holiday at the Verbier resort offers all the modern comforts and facilities of a major resort, with some of the finest cuisine in the region and a raucous nightlife combining English-style pubs and French cafés. Much of Verbier closes down over the summer but despite this it can also be a great summer destination with magnificent scenery, good weather and wonderful walks; during this time it is popular with paragliders and mountain bikers. Verbier, and the smaller holiday resorts of Nendaz, Veysonnaz, Thuyon and La Tzoumaz are all linked by one ski pass, which offers skiers and snowboarders one of the largest skiable areas in the Alps, including 102 miles (164km) of pistes of all standards. Verbier itself offers pistes for various levels of skiers and snowboarders. Advanced and intermediate skiers seek the resort's most famous slopes on the intimidatingly steep Mont Fort and the off-piste routes from Mont Gelé to Tortin and La Chaux. Verbier is also renowned for its vast amount of challenging off-piste skiing and demanding mogul runs, which are sought after by expert skiers and snowboarders. Beginners are also well catered for on a Verbier holiday with excellent ski schools, nursery slopes in the centre of the village and a wide variety of blue (easy) runs on Savoleyres and Lac de Vaux. The shopping while on holiday in Verbier is excellent, although expensive. There are a range of boutiques and clothing stores, as well as ski wear and equipment. A wide choice of restaurants caters to the international crowd on a Verbier holiday, with over 60 superb restaurants offering anything from traditional cuisine to Japanese and American fare. The Al Capone, Le Grenier and La Marmotte restaurants are well known for their good quality food, beautiful views and friendly staff. Local specialities like fondues, raclette and rösti are served in traditional establishments like La Channe Valaisanne, Vieux Valais and Le Carrefour. Vegetarians are well catered for. Fer à Cheval is a great pizza restaurant that is popular with regulars and is in walking distance from the main ski lifts. The main square is surrounded by cafés, patisseries and coffee shops. Verbier has one of the wilder and more exciting nightlife scenes among the European winter ski resorts. The road running from the main ski lift to the town centre is the heart of the après ski action and there are plenty of bars and cafés around the town square. The Pub Mont-Fort is a popular après-ski spot with the English holiday crowd, as are Big Ben Pub and The Nelson. The Offshore Café is a trendy spot for cocktails before dinner, while Bar'Jo and King's Bar are also quite popular. A variety of nightclubs stay open and busy until 4am. The Moroccan-themed Casbah Club plays techno-music, largely for a younger crowd. The Farm Club is perhaps the most famous nightspot in Verbier; it remains popular with Verbier old-timers and is the choice for many celebrities. Regular guests keep their own bottle behind the bar and are waved past the long queue. Coco Club is one of the most popular venues in Verbier; The New Club and Ice-Box Club are also trendy party places. Besides skiing and snowboarding, a Verbier holiday also offers heliskiing, a six-mile (10km) toboggan run, ice-skating and cross-country skiing. As a top Alpine sports centre, Verbier also offers a sports and fitness centre, indoor swimming pools, curling, a climbing wall and paragliding. It is one of the best sites for hang gliding and parascending. Summer activities also include walking trails and superb mountain biking. The ski resort has good facilities for children of all ages. Verbier's holiday accommodation, restaurants and ski passes are expensive and queues for the lifts can be long during the holidays. The snow reliability is fairly good in Verbier and it's usually possible to ski down to the village, but as with all European ski resorts, weather conditions are unpredictable and it can be cloudy.